In the mid 1980s, there was a sea change in British building design. Architects with whom Hunt had been closely associated turned their backs on component-based system building and the High Tech style that had been central to their design philosophies only a decade earlier. However, some new High Tech projects were still under way. 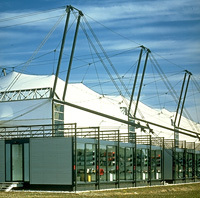 An example is the Schlumberger Research Centre (1985) in Cambridge designed by Michael Hopkins Architects. Its exposed steelwork and profiled steel cladding belong to the earlier period but, interestingly, its spectacular tented roof, gleaming white by day and glowing at night, foreshadowed the big budget landmark buildings that were to dominate the '90s architectural scene. Similarly out-dated was the Inmos Microprocessor Factory (1987) in Newport, South Wales, by Richard Rogers & Partners. Its exposed lattice pin-jointed steelwork, expressed tension rods and external service pods harked back to the '60s and '70s penchant for loose-fit, adaptable buildings. Anthony Hunt Associates was left to resolve the engineering for these projects at a time when the spirit of architectural adventure in which they had been conceived was all but exhausted. 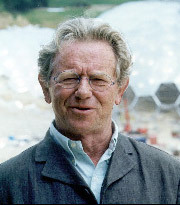 By the late 1980s, Anthony Hunt Associates had already collaborated with another firm, YRM, on a number of competition projects. YRM was a large practice made up of architects and structural and services engineers. A track record of successful collaboration inspired the two firms to join forces. AHA took over the structures group and became YRM Anthony Hunt Associates, one of five independent divisions. This arrangement was to last until 1997, when the YRM group failed. The 1990s brought a significant new commission for YRM AHA: the Waterloo International Terminal by Nicholas Grimshaw & Partners (now Grimshaw). This was to be the first London terminal for the Eurostar rail service, which routed through the then-new Channel Tunnel. Hunt's industrialised take on engineering here underpins a cost-effective prestigious building. A handfull of highly engineered components were produced in large quantities and assembled to form an elegant large-scale structure. Technical comparisons have been made with the architect Joseph Paxton's design for the Crystal Palace (1851). By the early 1990s, the role of the engineer had begun to change. Increasingly, projects demanded a multi-disciplinary engineering service responsive to changing social, architectural, economic and environmental challenges. As the industry moved towards multi-disciplinary integration, engineers had to focus their expertise to address a wide range of concerns, including façade performance, energy use, fire and safety aspects, building services and infrastructure as well as structural design. One such complex project, demanding multi-disciplinary input, was the Museum of Scotland (competition win of 1991) designed by architects Benson & Forsyth. Intricately planned and multi-levelled, with a towering atrium and glazed roof, the stone-clad concrete structure is located on a steeply sloping site in the heart of Edinburgh. Other Hunt projects of this period include Lloyds Register of Shipping (completed 1999, shortlisted for the 2002 Stirling Prize) by Richard Rogers Partnership and the Sackler Galleries (1991), part of London's Royal Academy. The 1990s also brought a number of stadium projects. The Hillsborough and Bradford stadium disasters led to the introduction of new safety standards that led many football clubs to rethink their stand arrangements; at the same time, the redevelopment of local stadia was seen as a useful spur to urban regeneration. Projects such as the Don Valley Stadium in Sheffield  a tented grandstand built for the 1991 Student Games  were an ideal showcase for Hunt's fluency with sophisticated exposed steel structures. For the Galpharm Stadium (formerly the Alfred McAlpine Stadium) in Huddersfield (completed 1997), Hunt designed enormous arched lattice steel trusses to span the length of the stands parallel to the pitch, providing unobstructed views for the terraced seating. Hunt had succesfully weathered a phase where fashion did not favour the skills he'd honed and perfected in the service of High Tech. By the '90s tastes were changing, and Hunt's vision was once again in demand. Schlumberger Research Centre (completed 1985) in Cambridge. Looking down the train shed at Waterloo International Terminal, by Nicholas Grimshaw & Partners. 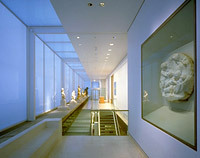 The Sackler Galleries (completed 1991), part of the Royal Academy in Piccadilly, London. Trusses are supported by concrete thrust blocks at the corners of the Galpharm Stadium (Alfred McAlpine Stadium) in Huddersfield (completed 1997).